QUESTION: Dear Mr. Armstrong, Thank you for your work in “educating” us in your “University of the Conscious Investor”! My question relates to your “Trading a Vertical Market” report. I am slowly digesting this report which is truly fascinating and a must read for any rational minded investor. My experience tells me (and you have reaffirmed this within your report) that being able to trade correctly for the market is critical. In analyzing the correct actions we must take I have reached the conclusion that we must also investigate deeply the trading company we use and how any wild ride will impact their ability to actually fund the successful trades we have managed to get into and out of. I recently was issued new T&C’s for my accounts to accept and that makes for scary reading in the light of any major reset or mammoth gap or moves we anticipate. How would you recommend we evaluate the companies actually holding the bag to be able to pay up at the end of the day? This appears to me to be a most crucial question in the light of what Socrates is pointing out. ANSWER: Yes, you are absolutely correct. Your broker/clearer is an additional risk. 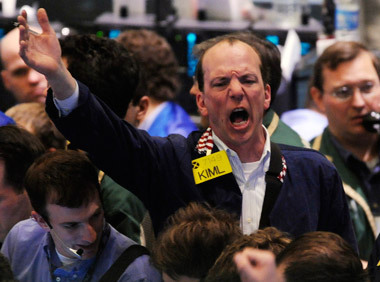 The kind of market conditions we are about to face will force questions beyond extreme volatility, no bids and the gapping of price and trade. What Traders must realize is that these extreme price actions themselves trigger increased margins, which again could trigger a liquidity crisis. Under such panic moves, prices can gap ‘without’ a trade and is worth remembering people sell what they can not what they should. This forces other markets to move just to raise cash. If market movements are violent everyone is pulled into the mix. This is when you have to hope that every one of your fellow account owners (under the broker/clearer you are using) is liquid enough to honor margin requirements. This type of information is rarely going to be available to all and so makes many remain vulnerable. Just to make you aware, it is possible that your money is vulnerable even if you do not have an open position and is just sitting with your clearer if they were to fail. A lot of people lost money in the MF Global Scandal.